Challenge: How can we reach out and support young people with reduced work capacity to be included in the society? This project started with the information that there is a large number of young adults who are not part of the society and that there is need to find solutions to engage them. Often, these youngsters have some mental or physical problems that lead to reduced work capacity. Various organisation are offering activities to support them to get an employment, to engage them in studies or to participate in meaningful activities. However, this stays a significant societal problem that calls for new solutions. Our group was assigned to reformulate the challenge and find alternatives through Design Thinking method, resulting in a solution that could help in the way to support these young adults. The reformulated challenge that our group created and decided to concentrate on is as follows: How to channel the communication between young adults with reduced work capacity and support organisations in order to engage their interests and abilities in meaningful activities? Through the whole Design Thinking process, we came up with four concepts. One of the concepts was chosen for further development and testing. The choice of the concept was based on deeper analysis and evaluation between the alternatives. 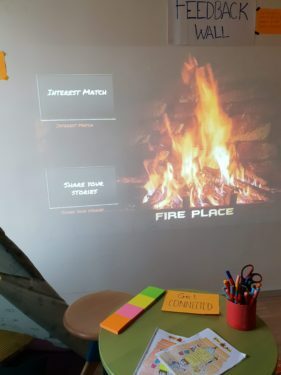 The chosen concept is called Fireplace, which is a digital platform connecting young people with activities based on their interests, while also connecting all the available activities and support providers in one place. The process and the solution will be presented in more detail in this project report.